After decades of isolation the 60 plus islands surrounding the southern coast of Cambodia remain largely untouched. 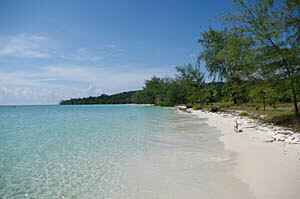 Koh Rong is the biggest Cambodia island off the coast of Sihanoukville. The majority of the island is undeveloped, though there are plans to develop it into a luxury resort destination. 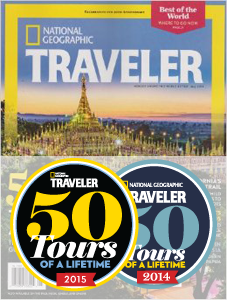 Right now, travelers can visit for a day trip, or stay in one of the few small beach resorts. There is around 27 miles of beaches, one of the most beautiful being Long Set beach. 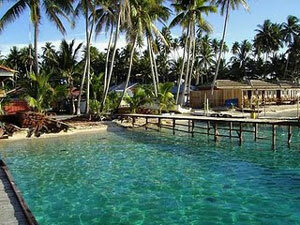 There are seven bays on the island, all offering great snorkeling and diving. There are also several nearby islands, easily accessible by boat. Other activities include swimming, hiking and fishing. From the mainland, it takes a little over 2 hours to reach Koh Rong, but it is well worth the journey to experience this tropical paradise. Don’t miss the opportunity to see this incredible island before it becomes a tourist hot spot! Visit Bantayan Island, located northwest of Cebu, where life is slower and you can enjoy the peace and tranquility of the beautiful beaches. Until recently, foreigners did not frequent Bantanyan. Though the tourism industry is growing on the island it still retains a secluded feel. There are no large shopping malls, major hotel chains, movie theaters, etc. There are a handful of restaurants and bars in Santa Fe, though Bantanyan is definitely not the place to go if you’re looking for nightlife. Bantayan is a place for travelers looking for a tranquil getaway and hoping to spend most of their days lounging on the beach. The warmth and friendliness of the locals allows travelers to learn about day-to-day life on Bantayan, where locals farm and live simply in bamboo houses. The island is just 7 by 10 miles, and has crystal clear waters. Renting a scooter is a great way to explore the Bantayan. Pulau Derawan is a tiny teardrop shaped Island off the coast of Indonesian Borneo. The island has idyllic beaches and excellent diving. Divers, or snorkelers, can swim with sea turtles and manta rays. The best diving locations are on the south and east areas of the island. In addition to water activities, visitors can also enjoy bird watching, hiking, exploring caves, or simply reading a book on the beach. Derawan has no electricity during daylight hours. The island can be walked around in less than an hour. Experience the slow island life on Derawan, where friendly locals talk to visitors, kids play in the street, and you’ll cross paths with turtles on the way back to your eco lodge. Situated off of peninsular Malaysia’s east coast, and a 45-minute boat ride from Merang, Lang Tengah is a picturesque island with white sand beaches, crystal clear water, and lush rainforest. The island’s coral reefs offer incredible viewing for divers and snorkelers. Some tourist attractions include St. Peter and Paul Church, a five century old Catholic Church and Ogtong Cave, a natural underground cave. With little to do but enjoy the superb nature and sea life, the secluded island is ideal for those looking to relax and enjoy the surroundings. 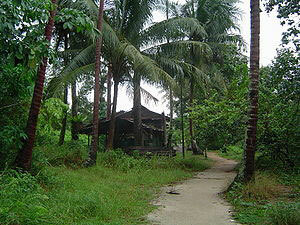 Pulau Ubin is the second largest off shore island of Singapore, located off the northeastern tip of the country. The island offers a look into the old Singapore, with an abundance of nature and lack of development. The island is only 5 miles across and 1 mile wide, with less than 100 inhabitants. The number of visitors per day is limited. This ecotourism initiative helps preserve the island’s fragile eco system, which includes vast areas of jungle and swamp that are home to a variety of animals. One of the best ways to explore Paula Ubin is by bicycle. One of the islands highlights is the Chek Jawa, a marine sanctuary of sea creatures and other wildlife. There are 2 scenic beaches, Noordin and Mamam, where visitors can camp for the night.